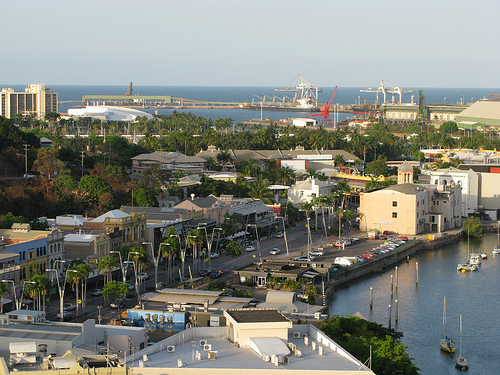 Townsville Australia is the largest city in north Queensland. 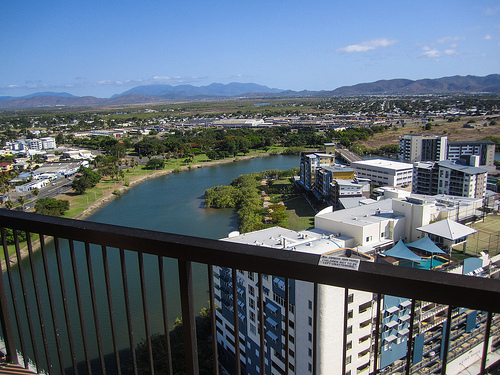 The second largest city in Queensland, Townsville claims to be the “Capital of North Queensland”. With a population more than twice of that of Cairns, it has got some excellent museums, parks and beaches, as well as good dining and nightlife. 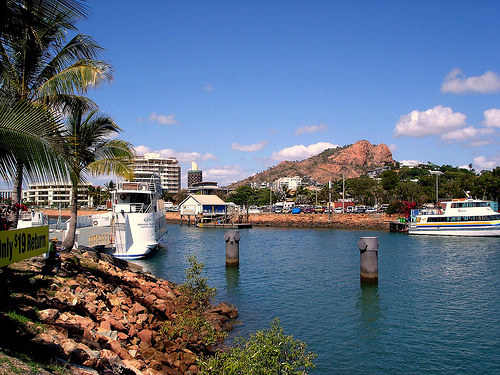 Magnetic Island is just off the coast, and the Great Barrier Reef a two-hours trip out to the ocean. The most obvious feature of Townsville is the Castle Hill right in the middle of the city centre. You can drive or walk up the hill, there are some excellent views of the city with Magnetic Island in the background. 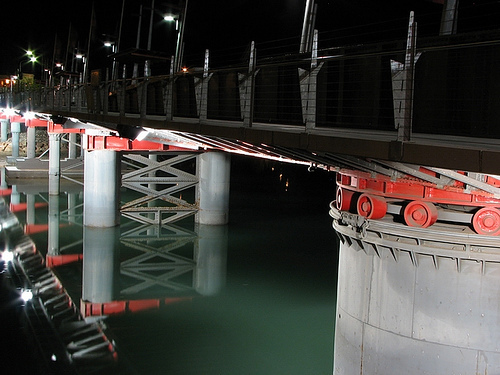 The central city is around the mouth of Ross Creek. 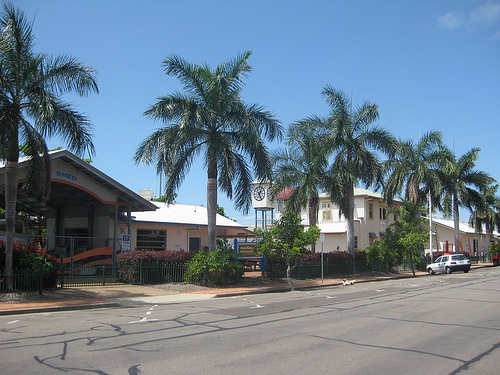 East of it is South Townsville with many of the town's best restaurants on Palmer Street, a few good pubs, hotels and the Transit Centre - the place where you arrive if you travel by long-distance buses. West of the Ross Creek (which you either cross by Dean St Bridge or the pedestrian Victoria Bridge), is the Flinders Street. In the north-eastern end towards the ocean it is called Flinders Street East, which is the hub of the town’s nightlife, with many Townsville pubs and nightclubs, but also some good restaurants. Towards south, across Dean Street, it turns into a pedestrian shopping mall, Flinders Street Mall, with shops, banks, a few eateries, and the central tourist information centre. On the mall are also the weekly Cotters Market on Sunday mornings. South-west of the mall the Flinders Street is known as Flinders Street West, where there are a few shops, pubs and restaurants, and the central train station. 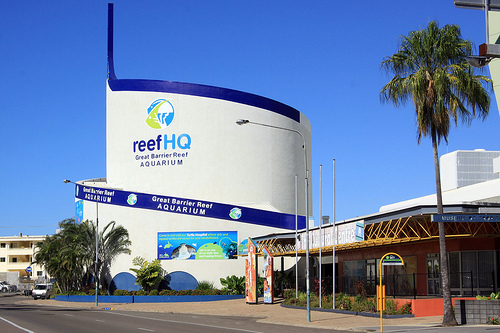 The town’s best museums are the famous Reef HQ Aquarium, Museum of Tropical Queensland and Townsville Maritime Museum. 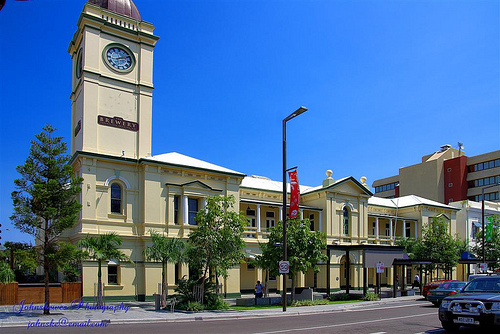 The Townsville Maritime Museum is on Palmer Street in South Townsville, while the other two are on Flinders Street East, on the bank of Ross Creek. The Reef HQ Aquarium is a beautiful miniature version of the Great Barrier Reef with its many species of coral reef animals. 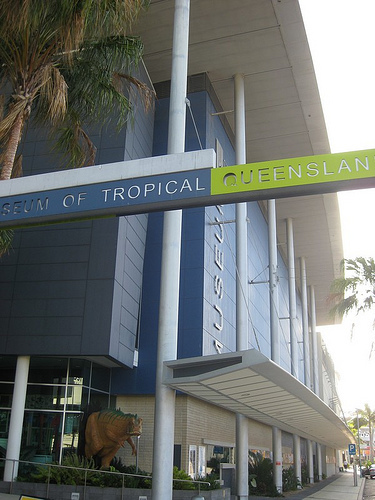 The Museum of Tropical Queensland has a lot of displays about the history of north Queensland, its people including Aboriginal people and early Europeans and also the sinking of HMS Pandora. The Townsville Maritime Museum tells the story of SS Yongala that sank in 1911 in a tropical cyclone. It lies in the ocean bottom south of Townsville (near Ayr) and is very popular with divers. 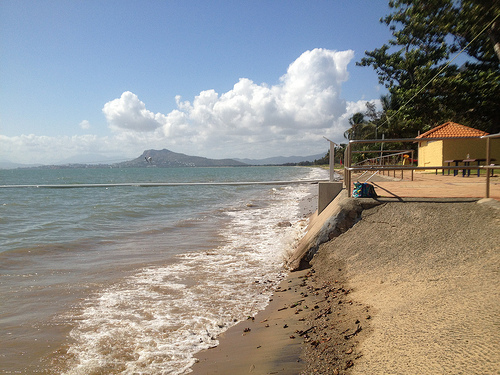 On the northern coast of Townsville, west of the mouth of Ross Creek, is The Strand – a lively beachfront esplanade, always busy with walkers, joggers, swimmers and roller skaters. There are barbeques and picnic tables as well as many cafes and bars right on the beachfront, with lovely views over Magnetic Island. The Strand Night Markets are held here during the first Friday of every month between May and December. 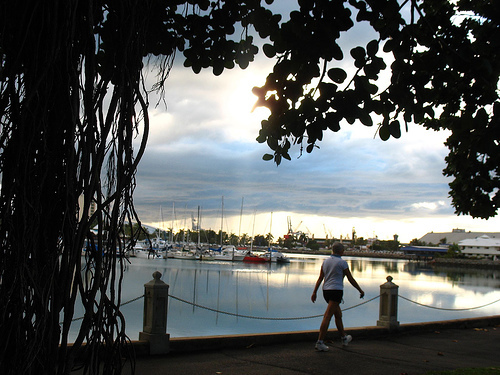 It’s also nice to have a stroll in Townsville’s many parks. Not far from The Strand are Queens Gardens with the town’s original Botanic Gardens from 1878. The new Townsville Botanic Gardens are in Anderson Park in Mundingburra; and in The Palmetum near the James Cook University, which has a lot of native palm trees. Back in the city, north-west of the Strand is Belgian Gardens, Rowes Bay and the beautiful Pallarenda Beach with beach barbeques and some nice picnic spots, and a long beach nice for walking. Also here is Town Common with wetlands famous for magpie geese, jabirus and other tropical wetlands birds. South of Townsville is Billabong Sanctuary, where you can get close to all sorts of Australian animals. 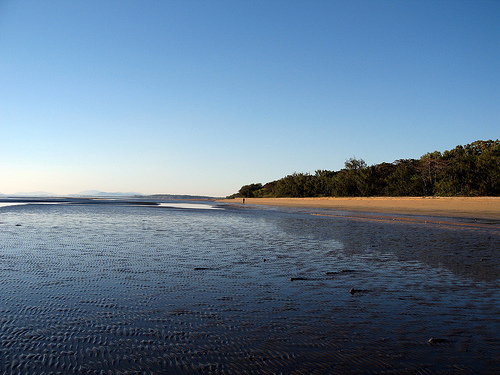 North of Townsville are the Townsville Northern Beaches, such as Balgal Beach, Saunders Beach, Bushland Beach and Rollingstone. And in different places outside the town are some great four wheel drive tracks. 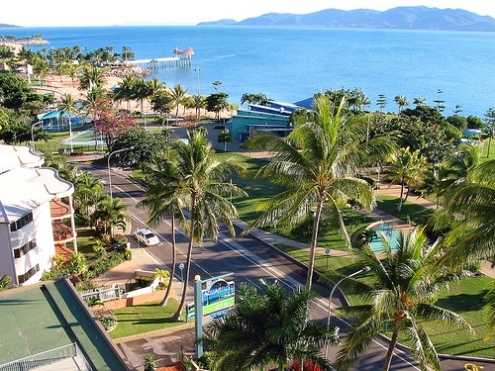 There are trips you can take to Magnetic Island and the Great Barrier Reef - both very popular with backpackers. 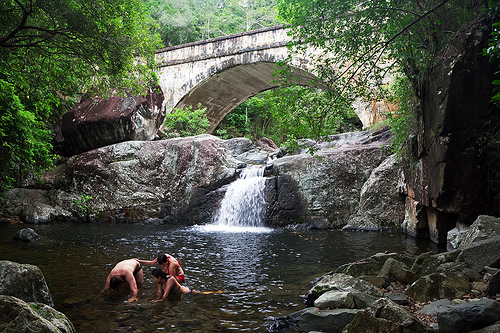 You can also vist tropical rainforests - Australian southernmost ones are just north of Townsville in Paluma Range National Park. 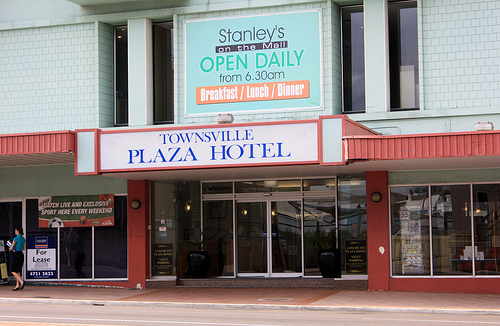 There is plenty of accommodation available in Townsville for all budgets. A backpacker optio is Reef Lodge Backpackers Hostel. Hotels, resorts and holiday apartments include Flag Plaza Hotel, Grand Mercure Apartments, Holiday Inn, Hotel M, Ibis Hotel, Jupiters Hotel, Leizure Inn Plaza Hotel, Mercure Inn, Oaks Gateway on Palmer Resort, Palm Waters Holiday Villas, Park Regis Anchorage Hotel, Quality Southbank Hotel, Quest Hotel, Rydges Southbank Hotel, Seagulls Resort and Strand Park Hotel. If you’re looking for a motel, there are Banjo Paterson Motor Inn, Beach House Motel, Best Western Casino City Motor Inn, Best Western Castle Lodge Motel, Best Western Cluden Park Motor Inn, Central City Motel, City Oasis Inn, Comfort Inn, Coolabah Motel, Shoredrive Motel, Summit Motel and Waters Edge the Strand Hotel. Here's a Townsville map, where I have tagged the places that I mentioned on this web page. You can click on the tags to see what places they are, and double-click anywhere on the map to zoom it in and see the places closer. Drag the map to move around, and if you want to see the satellite image with Google Earth, click on "Sat" in the top right hand corner.